But it’s still in October so there! Anyway, it is no longer a full moon, but it’s time for a rather large update! So, there’s that! 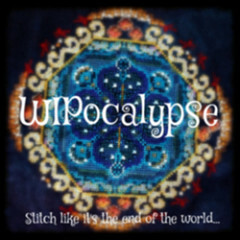 WIPocalypse is hosted by Measi at Measi’s Musings where she challenges us to stitch as much as we can before the world ends! Which, is probably in January of this year if you are living in America. Yes, that is a bad political joke. Fortunately, our fate will soon be decided. So now without further ado, let’s get to talking about the stitching progress! Like I said, there was much progress over the past few weeks (like six I think). To start, I have a finish!!! So I finished Whacky Witches on 10/16/16. I was super super happy, and then I just couldn’t get photoshop to work, so I never got around to posting it anywhere. Then I did a bunch of updates and photoshop works again! So yay!! I’ll be doing a Reflections post hopefully this or next week. Now, that would not be so bad…except for that dark patch off on the right. My choices were either try to frog all that out (and I don’t need to remind you what happened last time I tried to frog a lot of stitches) or to start again. So I went to Hobby Lobby and bought some 25 ct. Lugana Linen. It was barely big enough, but it was big enough for about an inch on the top and several on the sides. Anyway, here’s hoping that the third time is charmed and that I actually can get it finished eventually! I’m going to work on this one until I get a page done or until I get bored and decide to go back to Belle. The size, though, of Moonlight means I don’t really like taking it to work (though I could with my hoop and clips). So instead, I’ve been working on a few other projects during the down time. First up was my backup/emergency cross stitch that sits in my car for when I forgot Whacky Witches. This is SK Effects of Caffeine by Randal Spangler charted by HAED. I love the colors on this one! I’ve been super excited to work on another story keep after DaVinci Collie. So another design by the same artist and this one has both COFFEE and DRAGONS! That’s two out of my three obsessions there! If it had wolves, we would be three for three! I am using a 32 ct grey linen I received in an HAED Addicts Pouch. I think either 32 or 36 may be my favorite count. I love the size of the crosses. This will be a very cool hanging piece when I finish. 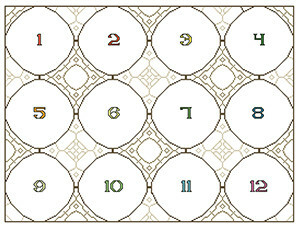 I will probably rotate this one in and out of the work-project. I made quite a bit of progress! I really do enjoy working on aida. And I love the way the colors on this one work. It stitches up pretty quickly with the large colors. I’m so close to that upper corner it is killing me! I’m like, only 30 stitches out!!! So that’s what I have been doing since September. I really do plan on being better about updating. Though probably not next Sunday (we will see). 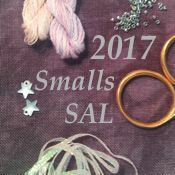 But I doubt much stitching will be done because I’m attending Running of the Leaves Convention! This will be my fourth year and I actually won a VIP ticket at the last con! So, exciting stuff! I started with Stitching Pirates on Deviant Art. I still regluarly participate in their stitch-a-longs, but haven’t been able to do a contest. Mostly because I am a slow stitcher for the most part and my stitching time is split between things like role-plays, work, and of course video games (Skyrim!! Skyrim!! Skyrim!! Final Fantasy 15, I have waited a decade for this game). I may not get much stitching done throughout the later half of November/December. But, we will see. I also have just started talking in the HAED Facebook group. And of course, I love reading the blogs from everyone!! That’s all from me this week! Now, if you excuse me, I have dragons to slay! Until next time!